April marks the completion of our second Noble Cause! Since December, i-Link panel members have been donating their reward points to Paws for Thought (PFT). 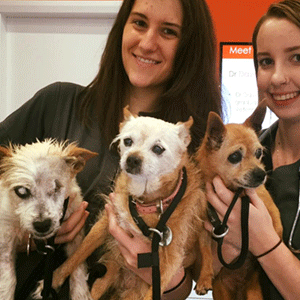 The group rescues, rehabilitates and rehomes dogs abandoned in NSW pounds, saving them from death row and giving them a chance at a ‘happily ever after’. Later this month the i-Link team will be meeting with PFT to see how the donated money has been put to use. This is one of the many initiatives i-Link is undertaking to put something back to the community! July 2016 – Talking Data At i-Link, we realise that the delivery of reliable data, on time, is of the utmost importance to our clients. For this reason, we don’t use automated systems to clean the data but give that responsibility to the Project Managers, all based in Sydney, who conduct checks manually. These checks, detailed below, are done during the pilot stage to identify the expected rate of poor responses and then again before delivering a final data file. Speeders – This involves comparing the average completion rate with the respondents completion rate. Rather than using a specific formula we do this manually in order to be able to look further into the responses of the potential speeders so we can identify if they have legitimately attempted to answer the questions within the survey. Flat liners – This involves looking at a list of statements which are rated on a scale and if 95% or more of the responses have been given the same rating then they would be considered to have not attempted to legitimately answer the survey. The context of the question is also considered in the event that a flat line response may be legitimate. For example answering ‘don’t know’ on the scale to a series of a statements they might not have an opinion on. Bad verbatim – This involves reading each of the responses to the open ended questions within the survey and determining if they have provided a legitimate answer to the question. Again the context in which the question is placed is also considered here. For example if they state they are an avid basketball fan but couldn’t name any basketball teams then their response would be considered junk. LiveTribe.com, an Australian online community, is donating $1500 to a central coast charity organization, Care for the Coast. The donation is provided through LiveTribe’s initiative, Noble Causes, and it is going to be used to create Christmas hampers for disadvantaged families living on Central Coast. i-Link’s LiveTribe community team will be travelling to San Remo from Sydney on Monday, December 21st to meet with Care for Coast volunteers and to present the hampers to the families. The funds were raised by LiveTribe members donating their survey participation points and LiveTribe.com. A LiveTribe community member, Kelly, nominated Care for the Coast earlier this year when the Noble Causes initiative launched. LiveTribe Noble Causes focuses on hyper local initiatives that help LiveTribe members’ immediate communities around Australia. It allows LiveTribe.com members to actively participate in charitable activities by nominating and donating to personal causes. Care for the Coast is the first LiveTribe Noble Causes beneficiary. AMRSO Quality Standards for Online Research (Access panels). Finally, in early 2015, we moved all our servers back to Australian shores. In addition, all our data is stored in an encrypted format and we continue to conduct regular penetration testing and security audits on the servers and systems. 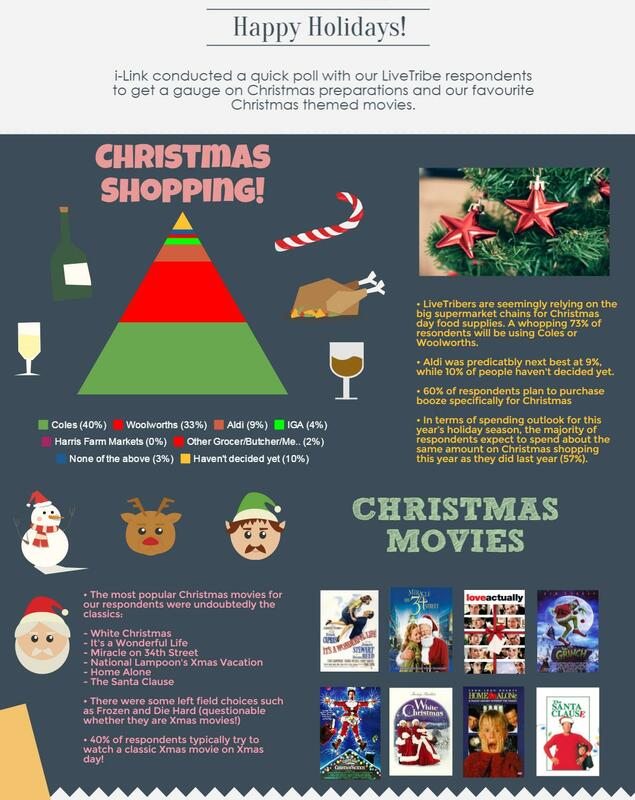 i-Link Research recently conducted a quick poll with our LiveTribe members to get a gauge on Christmas preparations and their favourite Christmas themed movies. 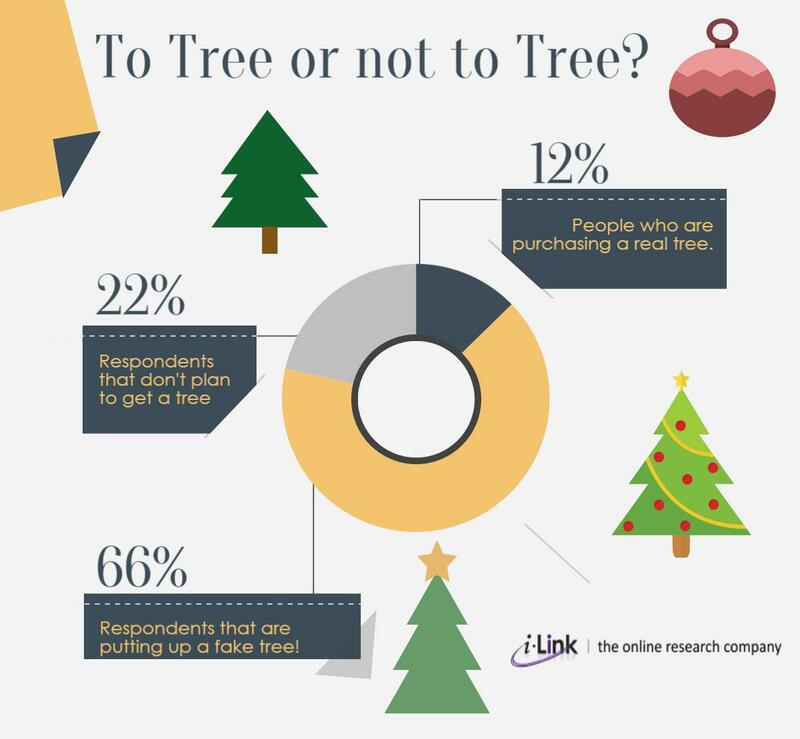 Respondents were polled through i-Link's own consumer research panel, LiveTribe, with a total sample size of n=480. The sample was drawn representatively to match the national distribution for age, gender and location in Australia. See the below infographic for a summary! 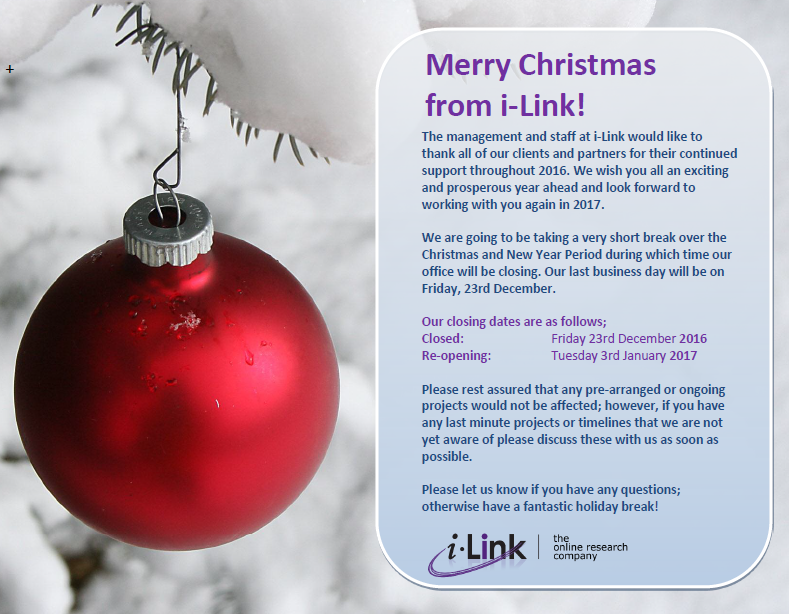 The management and staff at i-Link would like to thank all of our clients and partners for their continued support throughout 2015. We wish you all an exciting and prosperous year ahead and look forward to working with you again in 2016. Are you using i-Link minipolls? Struggling to determine an incidence rate for a potential project? Looking to quickly pre-target hard to reach respondents? Need to throw in some quick stats for a last minute pitch to a new client? 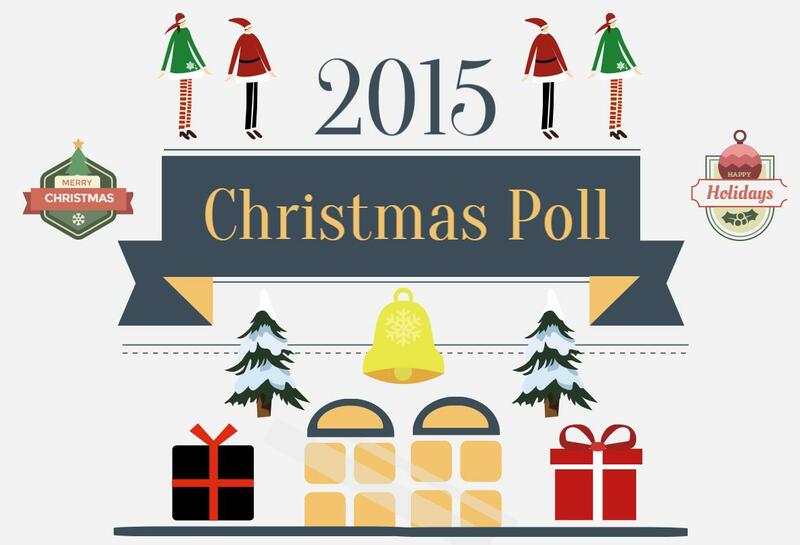 Book in an i-Link minipoll today and for a small fee we can usually set the poll up and launch within 2 hours. Specify your demographics, question(s), length of time in field and number of respondents and we take it from there! Contact Patrick via patrick@i-linkresearch.com and he will get the ball rolling.